As we get ready to move forward into April, we can look back at a few events and announcements that we missed on the blog. We've noted in the program listings that the PA Military Museum has started a new Monday and Friday program called PT in the PM, that mixes typical military physical training activities with a history of the grounds and some of the heavy equipment. 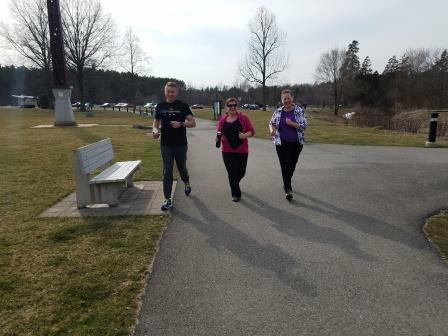 Many people use the pathways on the museum grounds for walking and jogging, so it seemed like a good way to reach out. Last week, Janice Mullin, chief of partner and placed properties, and bureau director Brenda Reigle were at the Military Museum and joined site administrator Tyler Gum for a tour (photo above). If you're in the area on a Monday or Friday afternoon, meet at the flagpoles at 4 pm and give it a go. Somerset Historical Center hosted a class last weekend for participants to create a 1700s-style women's ensemble of a shift, short gown, and petticoat. They shared some photos on Facebook. Upcoming sewing classes include May 6 (for kids and moms to create period clothing for an 18" doll) and July 15-16 (to create 1700s-style men's clothing). Visit the website for more details and to register. WITF (Harrisburg's public media organization) took their "Smart Talk" program on the road to the Railroad Museum of PA last week. Museum educator Patrick Morrison spoke with host Scott LaMar and there were some other guests as well. If you missed it, you can listen via WITF's website. Some students from Allegheny College in Meadville spent their spring break at the Erie Maritime Museum volunteering with the crew of the U.S. Brig Niagara. They assisted with the ongoing work of getting the ship ready for the coming sailing season. Photos on Facebook show happy, smiling people hard at work. The Univ. of Maryland is recruiting for its archaeology and historic preservation field school to be held at Eckley Miners' Village this summer. For-credit participants as well as local volunteers are welcome. See below for details from their Facebook page. April 2: Spring Lecture—Scott Wert, a teacher in the Conrad Weiser School District, will present a talk entitled "'The Calamett, a Sure Bond and Seal of Peace': Native-Pennsylvania Treaties as Religious Discourse." Site is open noon-4 pm, the lecture is at 2. April 2: Erie Maritime Museum Lecture Series—Richard E. Buys (Lt. Col, US Air Force, Ret.) will present "The Naval History of World War One and Erie's Contribution." Takes place in the H.O. Hirt Auditorium. Lecture is free. 2 pm. April 1: Museum Store Class—"Tin Punching" is this week's class. Check the brochure for details and registration info. April 1-2: Village reopens for the season—check the website for special activities planned, including the grand opening of the newly renovated blacksmith shop. April 2: Sunday programming starts for the season—this week is historic trades and cooking demos. Included in regular admission. 1-4 pm. April 1: Kids Day I: Dress Up and Discover! !—kids of all ages can try on field gear and head gear from the museum education collection. Photo backdrops will be set up in the museum theater and there will be learning stations throughout the galleries. Included in regular admission. 10 am-3 pm. April 2: Exhibit opening—"Pennsylvania at War: World War I Posters from the Pennsylvania State Archives" features a sampling of the nearly 500 WWI posters in the State Archives. Archivist Richard Saylor will provide a walkthrough of the exhibit (which will be on view through Nov. 12). Included in regular admission. Exhibit opening is 2-3 pm. Does it feel like spring yet? Look for the April program page coming late next week with lots of stuff to do on the Trails of History. Old Economy Village is known for its beautiful gardens, among other things. They have begun posting photos on their Facebook page as the gardens transition out of winter into spring (see above). You can follow them to track their progress as we move into summer. In-person visits will be possible again as of April 1, when the site reopens for the season. March 28: Panel discussion at Bucknell University—Dr. Bode Morin, site administrator at the Anthracite Museum and acting administrator at Eckley will be part of a panel discussion, "Immigrant Experiences of the Anthracite Coal Region." The program is part of a lunchtime series sponsored by the Bucknell Center for Sustainability and the Environment that takes place in the atrium lobby of the Weis Center for the Performing Arts. The program is free (bring a lunch if you like), and small tastes of regional foods will be provided. Noon. March 25: Something More Saturday—come celebrate Col. Edwin Drake’s 198th birthday and learn about life in the early oil boom era (and have cake). Included in regular admission; special rate - purchase 2 adult tickets and get 3 youth tickets free. 10 am-3 pm. March 30: Petroleum Program Series—this spring's series wraps up with "The United States Enters the Great War," Maj. Gen. John Stevens (ret.). Admission charged. Doors open at 6 pm, programs start at 6:30. 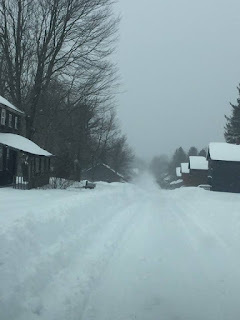 March 30: Winter History Class—this is the last class of the season. Even if you didn't enroll for the whole series, you can pay $8 to attend. Weather caused some changes to the original schedule; Dr. Jeff Bach will be on hand to talk about the Moravian Church. Call the site at 717/733-6600 if you have questions. 9 am-noon. March 25: Winter Learning for Adults—the final class for March is "Tole Painting" with Pat Oxenford; cost is $55 (register online or call 717/569-0401). 1-4 pm. Mondays and Fridays: Military PT on Grounds—Mondays and Fridays at 1600 hours (4 pm), the museum will present info on physical training in the military as well as the history of the museum and military equipment on the grounds. Take part in some calisthenics and a 1-2 mile run - a great way to liven up your workout. No registration necessary, just show up and join in. Meet at the flagpoles. 4 pm. Be sure to check the museum's Twitter account for weather-related or other updates on the PT schedule. March 24 & 31: Special Lunchtime Planetarium Shows—March 24 is "We Are Stars," exploring the secrets of cosmic chemistry. March 31 is "We Are Astronomers," which focuses on the challenges of studying our vast universe. Museum admission and planetarium fees apply. 12:15-12:45 pm. March 31: PA State Geography Bee—the museum will be hosting the state contest that determines who heads on to the National Bee in Washington. Galleries will experience "rolling closures" as the preliminary rounds of judging take place between 10 am and 3 pm. The final round will be in the auditorium at 3 pm. March 25: Berry Basket Workshop—learn to weave a reed basket over a wooden form, finish the rim, and attach handles. Participants will complete two baskets. All tools and materials will provided by the instructor. Fee is $50 per person; there is a limit of 12 for the class. Call 215/493-4076 to register. The March program page has info on events coming up this weekend and beyond. REMINDER: The State Museum of PA is closed this weekend, March 18-19, for electrical upgrade work. The weather was cold last Sunday for Charter Day, but more than 6,500 visitors (not counting State Museum) took advantage of free admission to help us celebrate Pennsylvania's birthday. Several sites have posted photos on Facebook - Anthracite Heritage, Ephrata Cloister, and State Museum of PA. And a couple of photographers have posted their own photos from Trails of History sites - Christopher Malone posted his photos of Landis Valley Village and Farm Museum on The Daily Antiquarian page and Ryan Patches, of Patches Photography, posted photos of Conrad Weiser Homestead's Charter Day activities. Thanks to Ryan and Chris for sharing! PennLive posted an article about the Last Raft, a reenactment of the log rafting that was a crucial part of the lumber industry in the first half of the 19th century. Leaving Clearfield County on March 14, 1938, the raft reached Fort Hunter, just north of Harrisburg, on March 25. En route, the raft hit a bridge pier near Muncy on March 20, throwing many passengers into the water, killing 7. You can learn more about the lumber industry and Pennsylvania's forests at the PA Lumber Museum. Tomorrow, March 18, the museum will host an event featuring Wood Hicks and Bark Peelers, a book of lumber region photos by William T. Clarke. Authors Ronald Ostman and Harry Littell are scheduled to be on hand to sign copies of the book, accompanied by Linda Ries, retired photo archivist for the Pennsylvania State Archives. Susan Holloway Scott of the Two Nerdy History Girls blog wrote about a recent visit to Brandywine Battlefield Park, where she toured the Gideon Gilpin House. 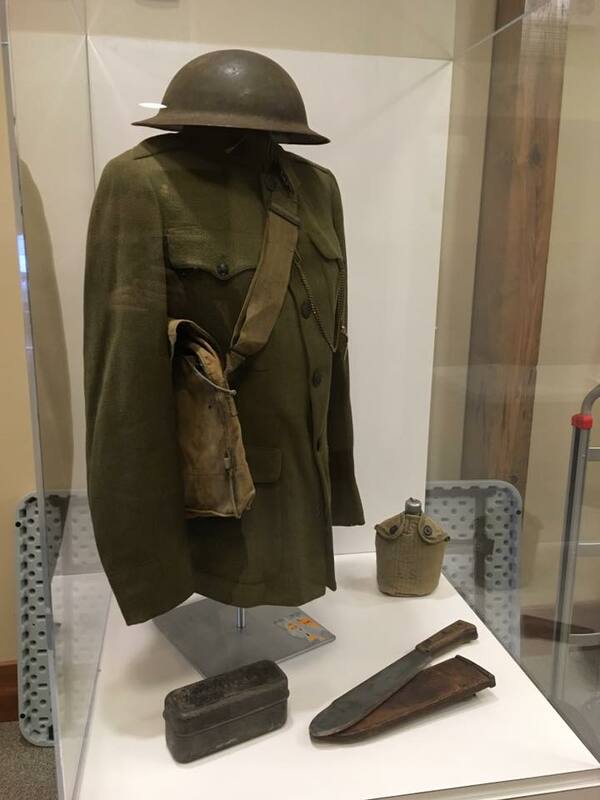 Pennsbury Manor, connecting the site's Quaker heritage to the PHMC's current #PAatWar initiative, has opened a small temporary exhibit about Pennsylvania conscientious objectors. The exhibit runs through July and includes material from the Pennsylvania State Archives and private collectors. In a related story, the PA Trails of History Facebook page posted photos (below) of curator Rachel Yerger cataloguing a World War II flight suit for the PA Military Museum; the flight suit belonged to Sgt. John Thomas Strine. As part of Drake Well Museum and Park's Petroleum Program series, site administrator Melissa Mann gave a talk on March 9 about Women's Activism in the Oil Region. She discussed the museum's ongoing research efforts to document women's history related to the oil industry and to the communities that were part of the region. You can read more about her talk in an article from the Titusville Herald. If you'd like to support this effort and other programs of the museum, you can donate March 20-24 through the Bridge Builders Community Foundations' Week of Giving online campaign (more info). The March program page has lots of info on events coming up. This Sunday, March 12, is Charter Day. Every year, on the second Sunday in March, PHMC commemorates King Charles II's grant to William Penn of the land we know as Pennsylvania. Most sites on the Pennsylvania Trails of History will be open free of charge (we have a list) as we wish PA a happy birthday and kick off the spring season (assuming the weather cooperates). 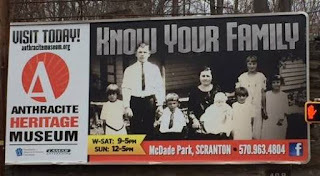 The March program page provides more info on special activities at the sites, and you can learn more in this article on PennLive.com. Don't forget that Daylight Saving Time begins at 2 am on Sunday. If you still have clocks that don't reset themselves automatically, be sure to "spring forward" an hour or you'll miss some of the fun on Charter Day. 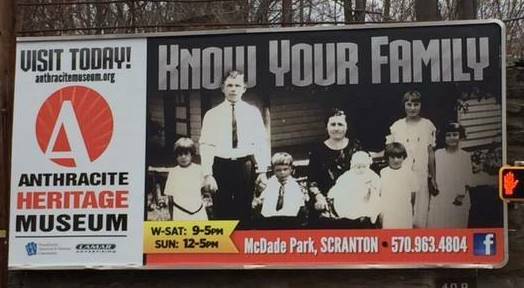 Thanks to Lamar Advertising, the Anthracite Heritage Museum has been a presence on billboards (above) around the Scranton area this month. Atlas Obscura, which highlights and explores places all over the world for its readers and followers, recently posted on Facebook about Ephrata Cloister. The Harrisburg area's public media provider, WITF, just announced that they will broadcast their popular "Smart Talk" radio program from the Railroad Museum of PA on Thursday, March 23. If you want to be part of the live audience and see the museum, you must RSVP (form included in this article on WITF's website). How did it get to be March already? 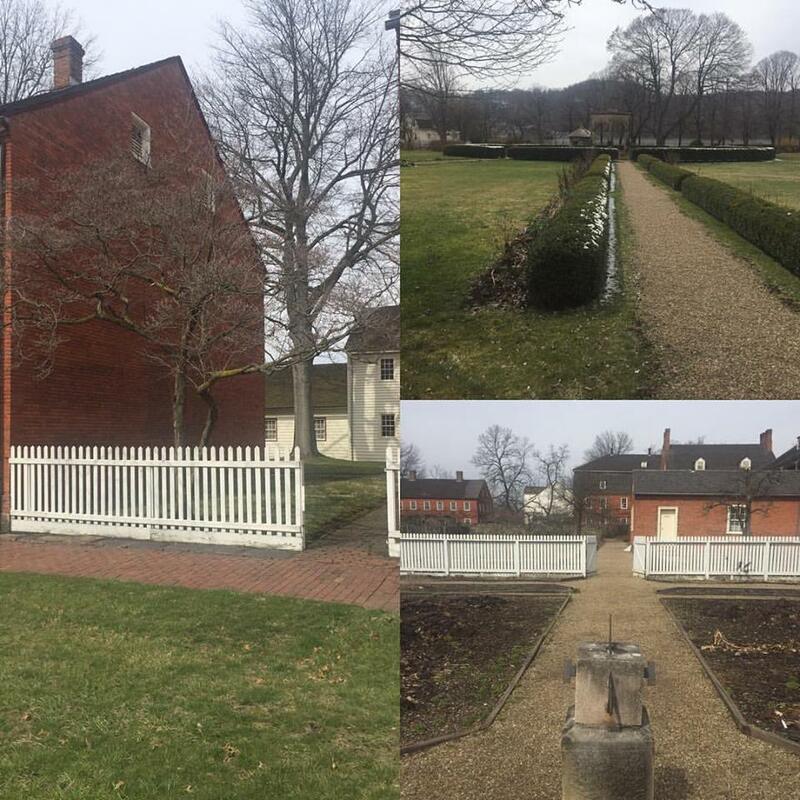 The March program page is up and running, along with the list of Trails of History sites open on Sunday, March 12, for Charter Day. On February 17, PHMC participated in #DayofFacts, which was an effort to highlight the work of museums, libraries, and other cultural organizations that are trusted sources of information about a myriad of issues. 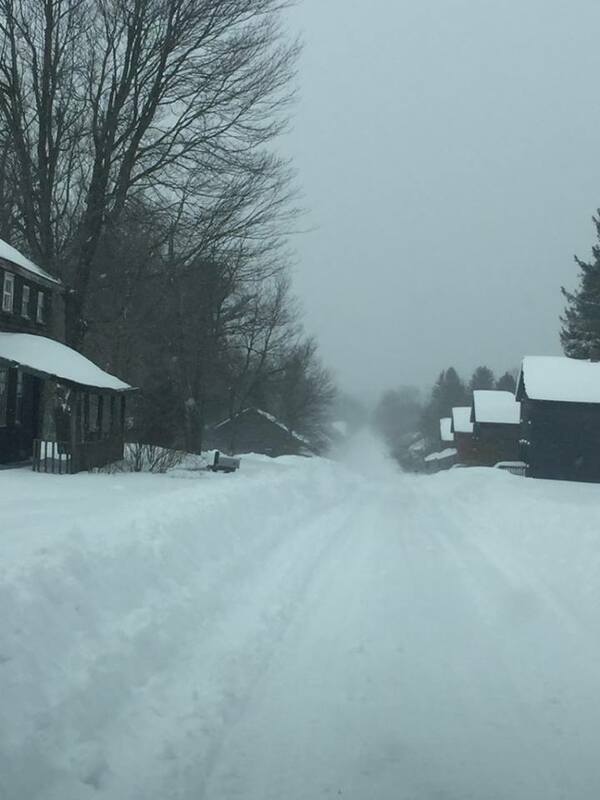 Sean Adkins, PHMC's social media manager, compiled tweets from the Trails of History on Storify. Please take a look to see some of the info we shared. Episode 217 of the Chemical Heritage Foundation's "Distillations" podcast looks at the cultural history and science of "fizzy water," noting the contributions of Joseph Priestley to the science of artificial carbonation (take a listen - it's a little over 13 minutes and the Priestley story comes near the end, but the whole thing was interesting to me). You can also learn about Priestley's life and work at the Joseph Priestley House in Northumberland, part of the PA Trails of History. Lab demos and house tours will be on tap at Priestley House on Charter Day. The PHMC's annual Summer Apprenticeship Program is currently accepting applications for a variety of training programs at various locations. PHMC and several partner organizations are offering paid 12-week apprenticeships for this summer to introduce students to the preservation and traditional building trades. The program is open to people with building trades experience and students/recent graduates of post-secondary trade schools, technical colleges, and other training programs. Hiring is handled separately by each sponsoring company or institution - find the info you need on the PHMC website and review the opportunities. The hiring period ends April 30. Pennsylvania Military Museum, Military PT on Grounds. Meet at the flagpoles at 1600 (4 pm) for some physical training and a 1-2 mile run on the grounds (learn a little about the military equipment and memorials). This is the inaugural offering of this program; it will continue on Mondays and Fridays through the month (and, we hope, beyond). No registration necessary; just show up. State Museum of Pennsylvania, Storytime. Read Fire Engine No. 9, by Mike Austin, and explore the Transportation and Industry Gallery (more details). Included in general admission. 10-11 am. Landis Valley Village and Farm Museum, Scratched Eggs class (registration required, details on this and upcoming classes). Cost is $30 (includes materials). 1-4 pm. Railroad Museum of Pennsylvania, Read Across America Day. Enjoy stories about trains, railroads, and amazing people, places, and things, read by a host of local notables (program flyer with storytimes). Included in regular admission. 9 am-5 pm. Somerset Historical Center, Volunteer Recruitment Event. Meet staff and current volunteers to see what possibilities await you. Event is free. 9 am-noon. Pennsylvania Lumber Museum, Heroes of Conservation Film Showing and Panel Discussion. The museum will show two documentaries, Mira Lloyd Dock: A Beautiful Crusade and Gifford Pinchot's Conservation Legacy starting at 1 pm (each runs about 30 minutes); a panel discussion will follow (more info on Facebook).